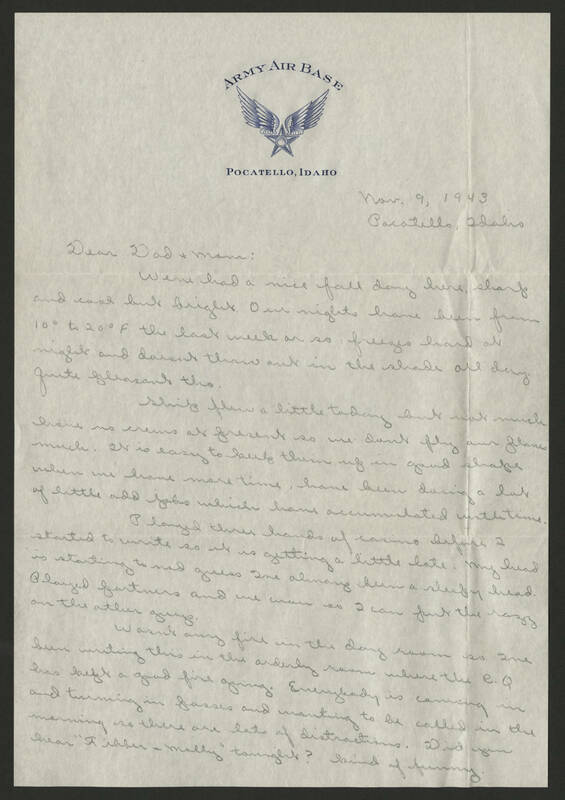 Nov. 9, 1943 Pocatello, Idaho Dear dad + Mom: Weve had a nice fall day here, sharp and cool but bright. Our nights have been from 10º to 20º F the last week or so, freezes hard at night and doesnt thaw out in the shade all day. quite pleasant tho. [Ship?] flew a little today but not much have no crews at present so we dont fly our planes much. It is easy to keep them up in good shape when we have more time, have been doing a lot of little odd jobs which have accumulated with time. Played three hands of [casino?] before I started to write so it is getting a little late. My head is starting to nod guess I've always been a sleepy head. Played partners and we won so I can put the razz on the other guys. Wasnt any fire in the day room so Ive been writing this in the orderly room where the C.Q has kept a good fire going. Everybody is coming in and turning in passes and wanting to be called in the morning so there are lots of distractions. Did you hear "A [fibber?] + Molly" tonight? kind of funny.